Mmm mmmmm! I've had this little book for about ten years now, and I pick it up from time to time to read bits and pieces from it, but it's been a while. So when I picked it up this morning and started from the beginning, it was quite the tasty snack! The author's name is Jack Stewart, and I don't know anything about him except this book. 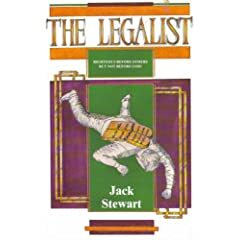 The book, published in 1989, is called The Legalist - Righteous Before Others But Not Before God. It's an easy read, divided into 26 short chapters. From Chapter 1 - "A Day in the Life of a Legalist"
A day in the life of a legalist is filled with trying to become and never arriving! He seems not to know that Christ means the end of the struggle for righteousness-by-the-law for everyone who believes in Him so he fights bravely and hopelessly on! Dwelling in a perpetual winterland of barrenness, where the cold blasts of condemnation and despair chill his soul, he rarely sees the sunlight of God's love and acceptance! Clouds of doubts and fear overcast the Father's face, Whom he imagines to be more critical than compassionate, frowning than forgiving. Bible reading, praying, giving, and witnessing are usually looked upon as obligations rather than joyous opportunities for the building and exercising of his faith. The pharisaical strait jacket he wears fails to make him holy, makes him look like he is, and deprives him of the joy of true holiness! Doing is the fruit of a right relationship with God; it is not the root! And the source of all right doing, is right being. In Psalm 1:3, the words He shall be like a tree planted by the rivers of water precedes and whatsoever he doeth shall prosper. From Chapter 2 - "The Roots of Legalism"
Of one thing we can be sure: if our righteousness is the fruit of our struggle, it is not the righteousness of God for His righteousness is a gift. Self-justification is not holiness even if it looks like it! If I understand correctly, the book is out of print but I see there are a few copies on Amazon and you could probably find it on Ebay too. Okay, Joel. I'm a sucker for good books so I just ordered a copy from Amazon. I'm intrigued too. So I picked a copy used from abebooks.com (my favorite internet used book store). I gotta have one too! I don't think either of you will regret your purchase. :) I'm not one who can stay focused on a book for extended periods of time, but this is one that is hard for me to put down!